Portronics Vibe comes with the dimensions of 180 X 90 X 35 mm and is packed with a 2000mAh Lithium polymer battery. It gets fully charged within three hours with a 5V USB charger. Portronics has launched its portable wireless speaker, “Vibe” with Bluetooth connectivity. It boasts of the slim factor and can produce loud sound due to its large bass and capable audio drivers, as claimed by Portronics. The thickness of Vibe is 35mm which makes it portable to carry it in pocket. 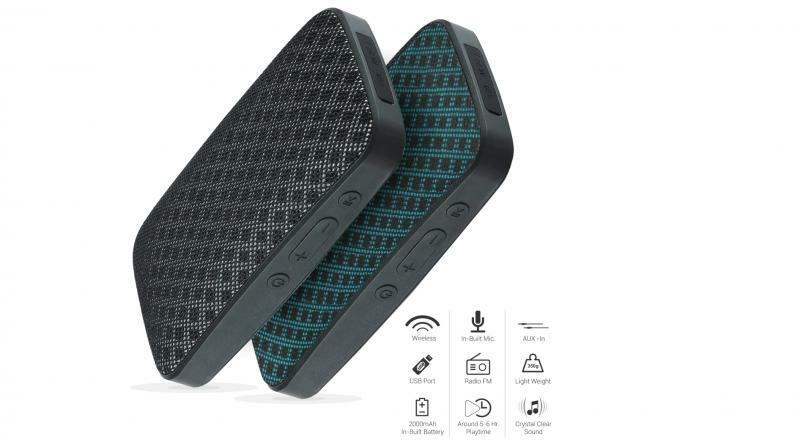 A matching textured fabric mesh on the front side of the speaker provides anti-slip grip. It is said to belt out clear, loud and distortion-free music from its 2x4W (8W) stereo speakers. The sound does not clip or stutter even when the battery is running low. Portronics Vibe comes with the dimensions of 180 X 90 X 35 mm and is packed with a 2000 mAh Lithium polymer battery. It gets fully charged within three hours with a 5V USB charger. Weighing a mere 350 grams, it is light which makes it convenient to carry. The intelligent powers saving function automatically turns off the system while the device is muted, paused or left idle for more than 10 minutes. The Portronics Vibe comes with the price tag of Rs 2,499. The packaging of the device includes one main unit, one micro USB cable and one 3.5 mm audio cable.